flashbulb memory: a highly detailed, exceptionally vivid “snapshot” of the moment and circumstances in which a piece of surprising and consequential (or emotionally arousing) news was heard. In psychology, it is said that learning about dramatic or traumatic events may lead to something of an indelible imprint in our minds – termed a flashbulb memory – the details of which seem more vivid and intact, albeit still imperfect, than other types of memories. They become like frozen tableaus. 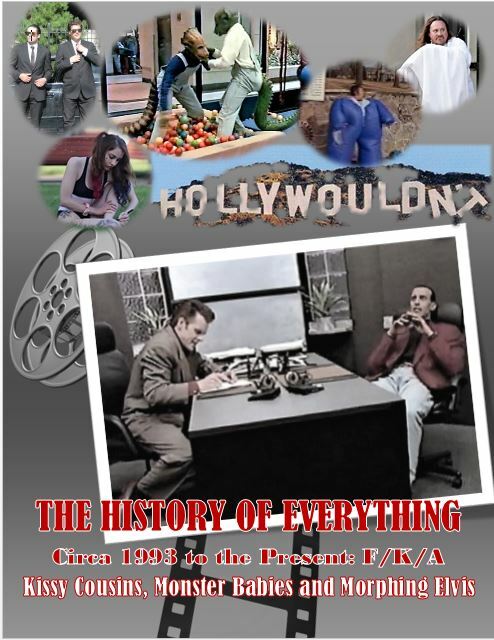 In part, they are more strongly recalled because they are typically shared in the public arena and are discussed often, whereby others’ experiences and recollections of the same event become part of a collective consciousness. They also are solidified and strengthened by the potent emotions they evoke and one’s personal connection to the incident. I touch upon this because for so many of us, we have heard about or even personally experienced countless disasters in our own communities or across the globe. Most can recall precisely where we were when we learned of the horrors of 9/11, the Boston Marathon bombings, or the Sandy Hook massacre. We can recount details about when we learned of the events and how they made us feel – and we continue to be haunted by them even today. The facts surrounding one such event, the deadly 2007 Virginia Tech shooting, are at the core of Long Wharf Theatre’s explosive new production, Office Hour. The tragedy was, at the time, the deadliest U.S. mass shooting carried out by a single gunman, taking the lives of 32 people and wounding 17 others in two separate attacks (with six others injured when they jumped out of windows). While I do remember the horrific incident, it is not as seared into my gray matter as the events which took place in Sandy Hook, Connecticut in 2012 – a tony little town situated a mere 12 miles from my home. Of Sandy Hook, I remember the paralyzing fear as the details first broke on the radio while I drove in the car with my husband; I remember soon after, talking to a woman in the produce section of Stop & Shop about what each of us had heard to that point; and I remember my heart pounding as the bile rose in my throat when I raced to retrieve and embrace each of my four children who were being released from their respective classrooms in our local elementary, middle, and high schools. Everyone was shaken. 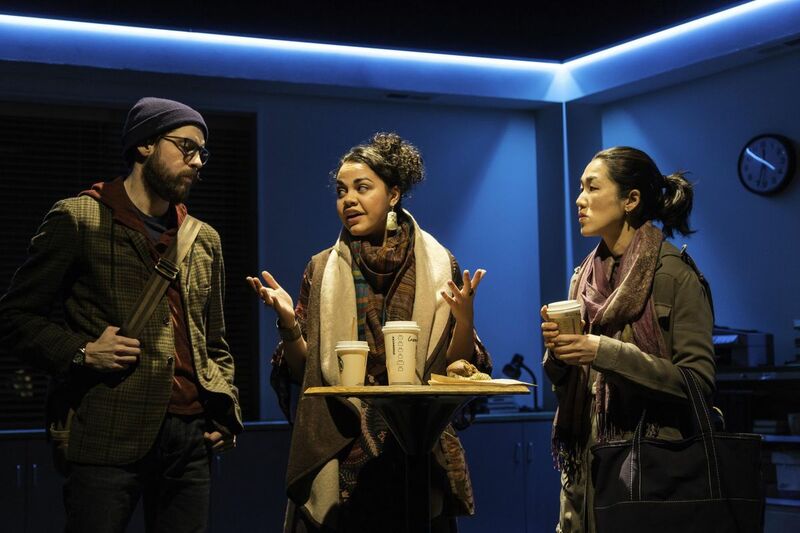 Playwright Julia Cho attempts to bring these questions and many others to light in her new drama Office Hour – but the answers are wildly elusive. When a trio of college professors, Gina, David, and Genevieve, meet over coffee to chat about a troubled student, they passionately consider what each has the responsibility to do. David and Genevieve are downright scared of him and they’ve reported it; they have had him in class before – a black hoodie-clad, sunglass-sporting, elective mute who writes perverse, frightening, violent essays that drive other students from the class. But what is a lowly, adjunct English professor to do? The semester has just begun, and Gina is more optimistic than her colleagues. She hears their concerns but also sees an opportunity. A chance to reach out. Dennis, the student in question, is also a first generation Asian-American like she is. If nothing else, Gina believes she can bond with him over the cultural and familial issues they likely share. With the best of intentions, however, she’s also considerably naïve – she’s not a psychotherapist and in no way is she equipped to deal with the level of disturbance Dennis exhibits. She doesn’t know what he’s capable of – and for that matter neither do we. Cho has cleverly elected to write a non-linear piece; instead, one that is deliberately and profoundly fractured, splaying out in many different directions. For the audience, we may never know what ultimately happens to these characters – but myriad scenarios mushroom right before our eyes. All our worst nightmares play out, one after another, after another, after another. In the end, we don’t have any idea what is real. Lisa Peterson capably directs a skilled group of actors in this immensely unsettling piece. 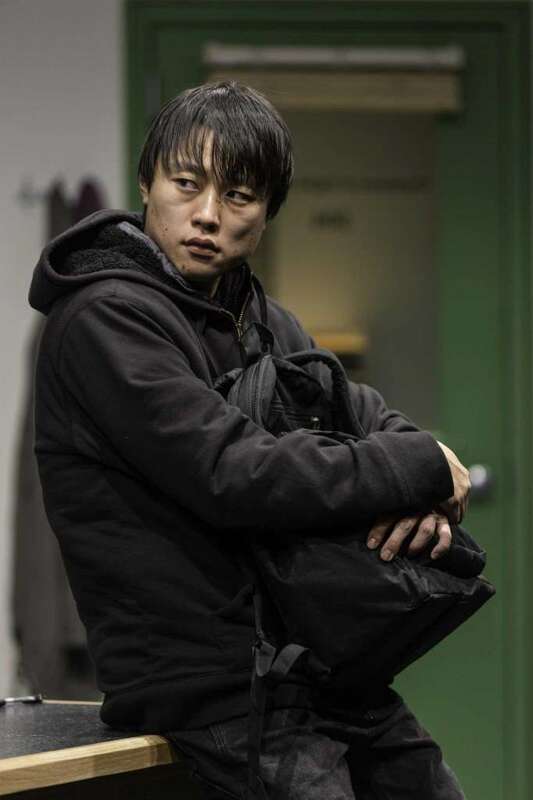 Daniel Chung as Dennis is chilling – to the point of making your hair stand on end. Expert body language replaces early dialogue in the most unnerving fashion. 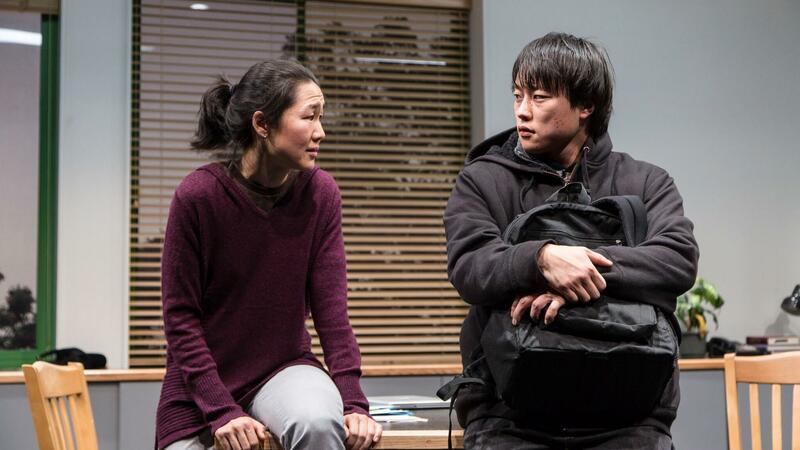 Jackie Chung as Gina is empathetic, hopeful, and altogether sincere and the exchanges between the two are both engaging and electrifying. Jeremy Kahn as David and Kerry Warren as Genevieve are outstanding as the very vocal professors who fear for their lives. Kudos to Matt Saunders for excellent set design and true attention to detail (an adjunct work area complete with ceiling vents and scuff marks on the walls); to Maggie Morgan for authentic costume design; to Scott Zielinski for excellent and powerful lighting design; Robert Kaplowitz for original music and sound design (be ready to jump right out of your seat). Shout-outs to Chris Waters as Production Stage Manager; to Thomas Schall as Fight Director; and to Calleri Casting and Amy Potozkin, CSA. Further, in the talk back that followed the show, an audience member brought up the recent initiatives, “Say Something” and “Start with ‘hello’ ” as part of the Sandy Hook Promise to prevent gun-related deaths. Both initiatives seek to fulfill the program’s mission; the former, to help children recognize potential signs of violence; the latter to encourage children to reach out to others who might be facing social isolation. These programs and their recommendations are bold, important, and necessary, and certainly should be taught early to our young people. But there is a difference in guiding a preschooler to say “hello” to a quiet classmate (something I always encouraged my own children to do); and quite another in reaching out to a highly volatile and disturbed young adult. I daresay I left the theatre concerned that some audience members may actually hold the mistaken belief that a simple kind word might be all that is necessary to prevent school violence. Office Hour has much to say and much to show. Not for the faint of heart (or minors for that matter as it is too graphic and hits too close to home), it may bring strong feelings to the surface. But it is overall, an excellent place to start some very important conversations – I know, because my husband and I spoke about it for the entire hour’s drive home. 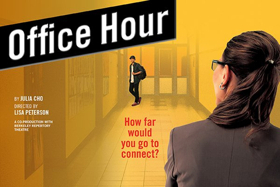 Office Hour, a new drama by playwright Julia Cho playing at Long Wharf Theatre, is an intense, powerful, thought-provoking theatrical piece which, not to sound like a TV cliché, is literally ripped from the headlines. The play deals with one of today’s most sensitive subjects – school shootings. To be more precise, the drama explores the potential for a school shooting and whether anything can be done to prevent it. The play begins with a bang – literally – and the faint-hearted should be well warned. Via opening exposition, we learn that two veteran teachers (convincingly portrayed by Jeremy Kahn and Kerry Warren) are fearful that one of their students is a potential shooter. Their beliefs are based on their observations and interactions (or lack thereof) with the student. Apparently, the problem child, Dennis, played with an eerily commanding (and even somewhat frightening presence) by Daniel Chung, is a lone wolf who refuses to talk or interact with his teachers or fellow classmates. His writing assignments are violent and horrific to the point where several of his fellow classmates have actually withdrawn and/or dropped the class. The teachers solicit the aid of newbie adjunct Gina (skillfully and realistically portrayed by Jackie Chung) to confront the troubled student in an effort to prevent what could turn out to be a tragedy of unimaginable consequences. Setting up a ruse that part of her teaching policy is to speak privately with each of her students during her office hours, Gina is able to have a one-on-one tete-a-tete with Dennis. In a scene reminiscent of the one in the film Good Will Hunting where Robin Williams’ character is able get Matt Damon’s character to open up, Gina does break through the wall of isolation and silence that Dennis has chosen to build around himself. Without dropping any Easter eggs or spoilers, suffice it to say that the rest of the play deals with an exploration into both characters and possible scenarios or outcomes based on what is revealed during the relationship and interactions that develop. 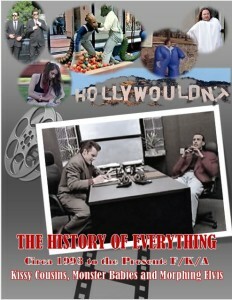 To a large extent, the drama which unfolds is not unlike the denouement of the play Constellations by Nick Payne. 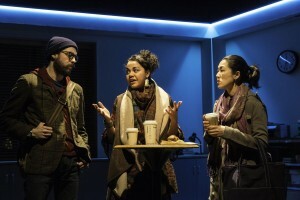 Indeed, Julia Cho, the playwright, discusses the non-linear aspects of the play in an interview and credits playwright Caryl Churchill, author of Cloud 9, for her inspiration vis-a-vis the structure of her play. The drama certainly resonated with me, and not just because I’ve been an adjunct professor for the better part of my adult career. Rather, the identification and empathetic response the play elicited because of today’s society where random and senseless violence have not only become staples, but actually the norm in some cases. Having said that, however, my nitpicky critique is that being an adjunct professor of communications, I found it somewhat unrealistic that an adjunct writing professor would even have office hours, much less try and psychoanalyze, diagnose, and treat a potentially psychopathic and homicidal individual who slipped through the cracks in the system. Director Lisa Peterson did a Hitchcockian job building suspense and anticipation of what was to come. 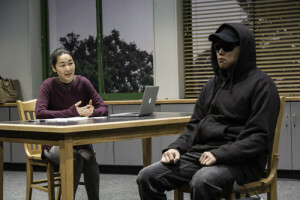 Obviously, the play raises more questions than it answers about violence and school shootings, but it serves as an excellent launching pad for more in-depth discussions concerning the major themes of the play including fear, empathy, abuse and racism. Office Hour is a haunting play. It stays with you like some recurring nightmare that scares the bejesus out of you in bed, and that you cannot stop thinking about even during the light of day.